Strengthening monitoring and evaluation systems in the WASH sector in Western and Central Africa. IRC is working with UNICEF, Akvo, and the Dutch government (DGIS) to support nine countries in West and Central Africa to strengthen the tracking and evaluation of progress on national water and sanitation goals. Improving water and sanitation services begins with knowledge about the state of services and the required level of service. This knowledge is not easy to maintain on regular basis and thus countries can find it challenging to act on the basis of recent data. In this programme, governments and stakeholders are working together assessing the national monitoring and evaluation (M&E) systems, including the definitions of a good ‘service’. Together, the partners will define and cost the actions required to link monitoring data and research on water and sanitation to actual improvements in the state of infrastructure and the water and sanitation services received. The programme takes place in countries with existing monitoring systems and where the government have requested support from UNICEF, Akvo and IRC for strengthening these M&E systems and tools. The programme is an activity within the larger UNICEF-led Western and Central Africa 9-country programme supported by DGIS. The identified needs of governments in this region will also guide the work by Akvo in this programme on improving their open source monitoring software, which is currently in use in the region. IRC and programme partners have developed a set of assessment and facilitation tools in English and French for working with country governments and stakeholders to strengthen national WASH M&E systems in the region. While the programme scope is Western and Central Africa, the tools are global in nature. However, as the purpose of the project is to accelerate and strengthen national M&E so that WASH services and asset management improve, this programme will focus on the use of data at the sub-national level and where services are delivered in districts and communities. Collecting, verifying and analysing data. Using data for decision making. These areas are made up of 12 components in total as shown in the figure below. The outer circle contains the six soft components on people, partnerships and planning. The middle circle depicts the five technical components. The centre of the circle is the ultimate target: the use of data to improve services. This framework is an adaptation of a well-established framework developed by M&E professionals in other sectors, most notably by UNAIDS for strengthening national HIV monitoring systems. and finally, the current priorities for WASH and national M&E to guide the assessment. Validating the choice of the assessment leads and objectives. Introducing the 12 components and collecting key documentation from these stakeholders to complete the assessment. The focus of this stage of the programme lies in bringing actors together and engage the sector. In the final stage, based on the outcomes of discussions in the country, priorities will be set for strengthening national M&E. Supported by additional research data, this is expected to lead to a costed activity plan which will be drawn up by the end of June 2017. In each country, there are different government agencies, donors and researchers involved in supporting M&E strengthening activities. 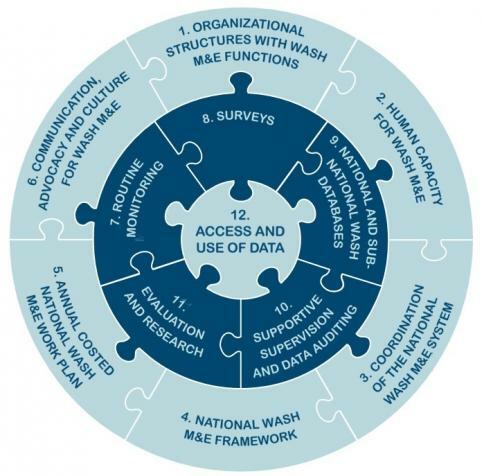 This programme offers a robust methodology for assessing national WASH M&E together and identifying the next steps to ensure that M&E data leads to improved water and sanitation services. This programme offers the opportunity to strengthen national systems so that it can better inform decision making and provide a strong foundation for meeting national commitments in WASH. These systems will also provide the foundation for tracking progress on the Sustainable Development Goal 6: Ensure availability and sustainable management of water and sanitation for all. The tools in this programme are developed as a guide for the countries and are adaptable to diverse contexts with or without external support. WASHNote is led by Nicolas Dickinson. He is an associate at IRC and has been supporting country-led monitoring and evaluation of water and sanitation services at national and district/municipal levels where government, civil society and private sector set the monitoring agenda and the questions to be answered. In addition, he has worked on providing training for decentralized data collection, data processing, and life-cycle costing. He evaluated mobile-enabled water, sanitation and energy services for the Mobiles for Development Utilities Innovation Fund as a Grant Panel member and supports the commissioning and procurement of technology for governments and the WASH sector. Along with his passion for the use of evidence, he worked on developing data exchange and technology standards (WPDx) and tools for service providers, governments, NGOs and financiers.